Site Owner may elect to resolve any controversy or claim arising out of or relating to these Terms or our site by binding arbitration in accordance with the commercial arbitration rules of the American Arbitration Association. Any such controversy or claim shall be arbitrated on an individual basis and shall not be consolidated in any arbitration with any claim or controversy of any other party. The arbitration shall be conducted in Terry, Montana, and judgment on the arbitration award may be entered in any court having jurisdiction thereof. Either you or we may seek any interim or preliminary relief from a court of competent jurisdiction in Terry, Montana, necessary to protect the rights or the property of you or Site Owner (or its agents, suppliers, and subcontractors), pending the completion of arbitration. These Terms shall be construed in accordance with the laws of the State of Montana, and the parties irrevocably consent to bring any action to enforce these Terms before an arbitration panel or before a court of competent jurisdiction in Terry, Montana if seeking interim or preliminary relief or enforcement of an arbitration award. 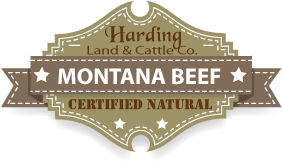 Harding Land & Cattle Company is the trademark of Harding Land & Cattle Company. This entire website, copy, images, logos, indicia, text, content, and unique method of showcasing products is ©copyright 2013 Harding Land & Cattle Company • PO Box 905 Terry, MT, 59349. All trademarks appearing herein are acknowledged. Permission to use documents delivered from this World Wide Web site and/or server and related graphics is restricted. The name of Harding Land & Cattle Company or any of the above referenced trademarks or logos may not be used in advertising or publicity pertaining to distribution of this information without specific, written prior permission. The information contained in this website is subject to change without notice. Harding Land & Cattle Company is not responsible for typographical, technical, or descriptive errors, misrepresentations, or misunderstandings of products, services, companies, persons, or events listed or posted herein.